When planning an overseas holiday, most people will refer to travel guides from Lonely Planet or DK Eyewitness about their country or city of choice. Some people may choose to use the less common (but equally as useful) guides from Berlitz, Frommers, Michelin or Wallpaper. Some may forgo travel books altogether and instead rely on websites such as Tripadvisor.com to satisfy all of their activity, eating and sightseeing requirements. 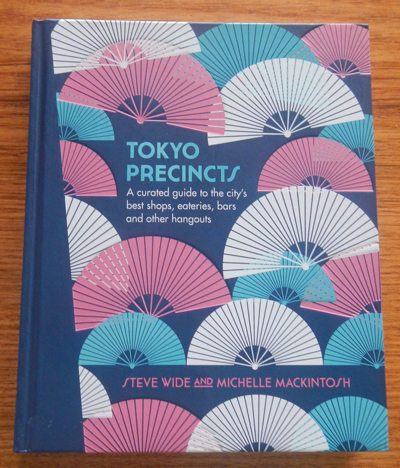 But if you’re looking for a beautifully presented book, which focuses more on lesser known, somewhat quirky shops , eateries and bars within Tokyo, Japan, then Tokyo Precincts may be one of the best options for you. Sidestepping the ideas of some of the more traditional travel guides, this book divides Tokyo’s large city boundaries into nineteen districts, and explores some of the more unusual places that you wouldn’t ordinarily see in your run-of-the-mill travel guide. Forget sightseeing ventures and the places that tourists would normally frequent- this book covers a myriad of interesting shops, hole-in-the-wall restaurants and cafes, and trendy or traditional bars that you’re more likely to find the locals at. That isn’t to say that a foreigner would feel totally out of their depth in visiting these places- the authors are adamant that tourists are just as welcome (with some food places offering menus in English), and may become more ‘culturally’ enriched by the experiences that they share. Indeed, visitors are more likely to experience a different side of Tokyo-visiting extremely cool shops and restaurants- that most tourists may not find in their average travel guide. Sorted by precinct, each section is mapped out with the reviewed places pinpointed (so you can see exactly where they are within the vicinity of each other). The pages following then review the authors’ picks of the best shopping and food places in the area, covering about seven to eight different establishments. Featuring arty and enticing photographs of each place, the reviews also feature current address and contact information and (quite handily) a train station guide. If you aren’t aware, Tokyoites rely heavily on their exceptionally efficient public transport system- in particular their train and subway lines. With so many stations (and so many exits to the stations), it’s very easy to get lost if you don’t know where you are going. Therefore, the authors have also included the best station exits to use when trying to locate various places. People looking for ideas on the best things to buy, eat and drink while in Tokyo can also use the handy reference guide at the beginning of the book. At the back of the book, the authors have included general (but important) travel advice and information regarding Tokyo’s customs, currency and transport system. This book, while beautiful to look it, is not really practical to travel with (it’s a little too heavy and large to pack in your suitcase), but it provided plenty of useful focal points on my recent trip to Tokyo. Focusing more on art and craft stores, traditional or out-of-the-way noodle houses and hidden bars, this guide carries more of an artistic or hipster vibe, and is best suited to people of that nature. Have a flick through it, jot down (or photocopy) some notes, and you’ll have a much more unique experience when travelling through one of Asia’s most exciting and amazing cities. Note: There is also a Hong Kong Precincts book available.